Toby Imada must be tired of not winning tournaments. 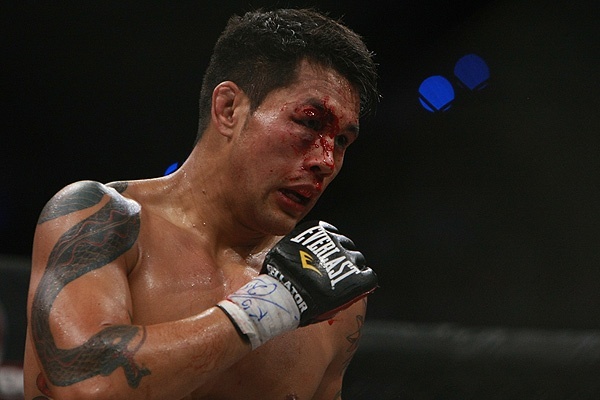 With the exception of Bellator's more recent fourth season, in which he lost in the semis, Imada has fallen short in Bellator's first and second season lightweight tournament finals, as well as Shoot Boxing's S-Cup 2010 tournament. His early career also shows championship round losses in two "Neutral Grounds" 4-man tournaments. While his run to the championship round of last year's S-Cup was a huge surprise to most fight fans, it must be one in a series of dissapointing tournament outcomes for Toby Imada. At the 2010 S-Cup Imada edged two-time K-1 champion Andy Souwer in what some consider a controversial win. Nevertheless, Imada's win over an experienced kickboxer/shootboxer in his first Shoot box outing was the talk of the tournament, and now that Imada appears to be making himself a fixture in the growing Shootboxing scene, it's obvious that he is one of the organization's most marketable faces. Fans look forward to seeing Toby Imada and Andy Souwer go square off in a rematch of last year's memorable S-Cup semifinal match. Shootboxing head honcho Takeshi Caesar didn't wait long to release info about the rest of SB's 2011 schedule. There is an amateur event coming up in July. The tournament will be held at the Toki Messe Convention Center in Niigata, Japan. According to the SB site, it's part of the Young Caesar Cup series. The S-Girls Cup is happening as well. On Sunday August 21, the S-Girls Cup 2011 will commence. RENA will be in action to defend her title and try for the "Three-peat." No other participants have been confirmed, but likely Ai Takahashi will be part of the tournament. The big finale for the 2011 Act game series happens on Sept 10, 2011, and is why this article is linked to the Act 4 event. Act 4, as just noted will be on Sat Sept 10 and will happen at Korakuen Hall in Tokyo. Matches have already been announced. Two matches have been signed. Kanai Kenzi (who was victorious at Act 3) will face Suzuki Satoshi. The Main Event hasn't been formally announced, but this fight has to be the Main Event: the rematch of Andy Souwer vs Toby Imada! That wll be a huge rematch as Andy would love to redeem himself. Also fighting will be SB veteran Shishido. SB has a tournament slated in Osaka this October. Then on Nov 5 and 6, SB and Shooto will ahve "Shoot The SHOOTO" at the Tokyo Dome City Hall. Then on Nov 11 there is another event at Korakuen Hall. As events take shape, I'll do my best to keep you informed. As it stands, Shootboxing has a full plate of action for the rest of 2011. Just to clarify, Souwer vs Imada is going to happen at Act 4, but it wasn't announced as being the Main Event. With those two names, that match has to be the main event. And what better time to watch Imada and Souwer clash heads at the S-Cup last year? Title or no title, all hail Toby Imada's spectacular inverted triangle submission against Jorge Masvidal! Toby Imada hasn't had time to develop as a kickboxer. He is basically a grappler. But his overall fighting skills seem to be changing the direction of shootboxing. He took out an experienced standup striker Umeno in his first fight by knockout. He neutralized a clinching and striking Andy Souwer. He could barely standup when he faced Buakaw. And he threw Shishido all over the ring. If he ever decides to develop his striking and kicking, watch out!